ITSM is an OEM-independent hardware maintenance provider. ITSM believes that organisations should not limit themselves with the end-of-life notices coming from their vendors. Often, hardware have longer useful life, longer than the support hardware vendors can provide. We extend the lifecycle of your IT infrastructure through our third-party maintenance (TPM) support services. Now, you can upgrade when you want to upgrade, not when the vendor wants you to upgrade. Flexibility: We offer solutions that are directed to what your company needs. Global Reach: We have in-country part sparing strategy coupled with services capability in most developed countries. Multi-Vendor Support: We support various hardware and we are vendor agnostic. Improved SLAs: More often than not, we will improve service level agreements (SLAs) in your existing OEM support agreement. Huge Cost Savings: You get excellent IT support and hardware maintenance service at a price much lower than what OEM offers. Less OEM Contracts to Manage: By working with ITSM, you don’t have to manage various maintenance contracts from different vendors. One support agreement, one account manager, and one organisation to manage your IT infrastructure. A telecommunication company in Australia owns numerous Cisco data centre switches and networking devices. To get the technical services and software support, they paid $400,000 annually for Cisco SmartNet. The premium cost plus the fact that equipment is getting expensive to support as it gets older prompted the management to explore cost-saving options. 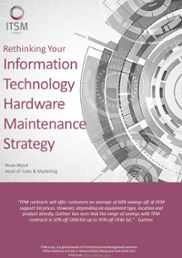 The IT director explored third-party maintenance, which led him to an in-depth discussion with ITSM about the benefits of working with a TPM vendor and the potential savings they can achieve. Fully convinced with the numerous benefits, the organisation decided to work with ITSM not only for their Cisco equipment but also with their other data centre hardware. The organisation reported a 70% savings by working with ITSM, which amounts to $280,000. From $400,000 annual maintenance costs, it went down to $120,000. © 2018 Information Technology Services Management (ITSM) Corp.